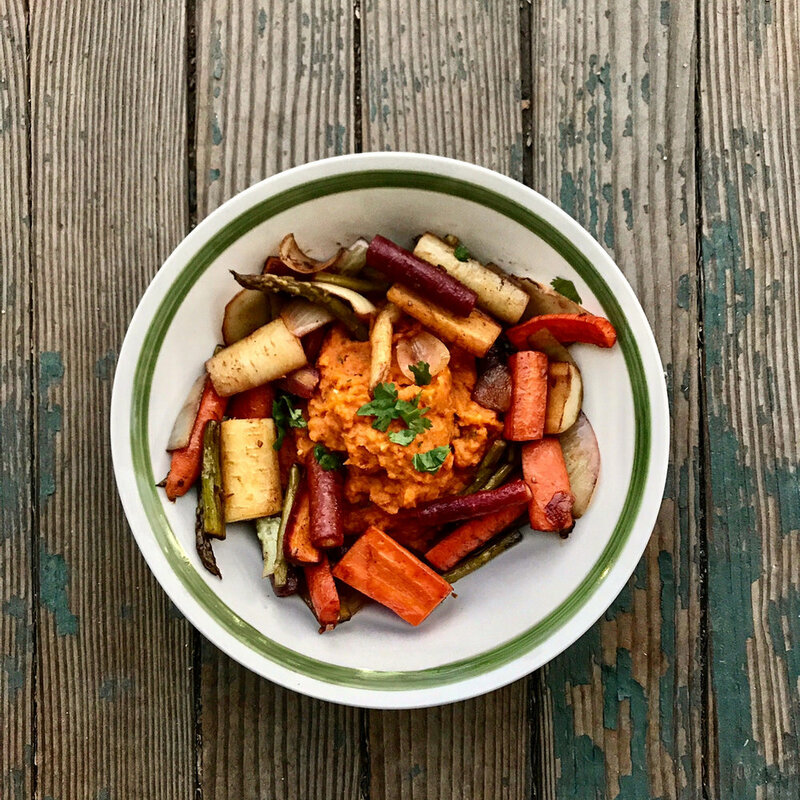 These mashed sweet potatoes are smooth, creamy, delicious and completely plant-based! They are full of flavor and are naturally sweet. I love incorporating sweet vegetables into my recipes because they help to curve sugar cravings. The more sweet vegetables you eat (such as sweet potatoes, carrots or butternut squash) the less you will crave processed sugars. I paired it with roasted carrots, asparagus, onion and garlic and garnished with parsley. This is the ultimate fall dish and it is super easy to make! 3 lbs sweet potatoes peeled & cut into 1’’ cubes. 1. Place sweet potatoes in a large pot, cover with water and bring to a boil. 2. Let the sweet potatoes boil until they are nice and soft in the inside, roughly 20 minutes or so. Once they are ready, set aside. 3. Preheat your oven to 475 degrees. Toss all of the ingredients for the roasted veggies in a large bowl and then add them to a baking dish. Cook for 35-40 minutes. Make sure to stir them every 10 minutes so they get cooked evenly. 4. While your veggies are roasting you can start on your sweet potatoes! Add your sweet potatoes to a high-speed blender, a little bit at a time. You may need to add your coconut milk while doing this to make it easier to process. Make sure your coconut milk is heated up prior to adding to the sweet potatoes so that it doesn’t cool them down! You can do this over the stove on low heat or in the microwave. 5. Once they are nice and smooth, add the remaining ingredients and blend until thick and creamy. 6. Season your mashed sweet potatoes with salt and pepper to taste and once they have a nice smooth consistency they are ready to go! Serve with your roasted veggies and garnish with parsley.